A warm, funny, and anarchic superhero movie about the power of family, "Shazam!" is total magic from start to finish. From “Watchmen” to “The Incredibles” and most of the Marvel Cinematic Universe, there have been any number of movies set in a world where the general public knows about the existence of superheroes. The common folk in these films refer to such enhanced (and sartorially flamboyant) individuals as “mutants” or “paranormals” or “Avengers,” but the terminology doesn’t really matter because the basic dynamic is always the same: Regardless of whether they’re thought to be threats, saviors, or something in between, anyone in spandex is fundamentally separate from general society. Of course, it’s never an even split, because power is an inherently unequal thing. Those who have it look down at the faceless masses they hope to help, rule, or exploit; those who don’t look up and feel as small as they might seem from above. Probably. It’s hard to say. We seldom get to see these stories from their perspective. Perhaps that’s why “Shazam!” is such an unexpected joy from start to finish — at a time when Hollywood is choking to death on all the superhero films that studios keep ramming down its throat, here comes one that looks at the genre in a different light and reconceives it on a human level. It doesn’t break the mold so much as it plays with how flexible the mold can be. Warm, witty, and bursting at the seams with great characters, “Shazam!” is easily one of the most fun superhero movies ever made; even after the euphoric “Spider-Man: Into the Spider-Verse,” that’s still a low bar to clear, but it’s worth celebrating all the same. A foundational comic book figure whose history is complicated enough for this movie to ignore most of it, Shazam has always been like Superman’s goofy second cousin, and that tradition definitely holds true here. But “Shazam!,” which often feels suspended somewhere between “Deadpool” and “Shoplifters,” is never too silly to be taken seriously. A curveball of a prologue immediately demonstrates how director David F. Sandberg (“Lights Out”) is able to balance the cartoonishness of the film’s hero character with the sincerity of his story. The year is 1974, and a kid named Thaddeus Sivana (Ethan Pugiotto) is fiddling with a Magic 8 Ball in the back of his father’s car during a long drive in the dead of winter. It would be hard for that fortune-telling little toy to predict what happens next: Young Thad is spirited away to some ancient cave, where the cranky old wizard Shazam (a gray-bearded, amusingly urgent Djimon Hounsou) tests to see if the boy is pure of heart and able to resist the temptations of the Seven Deadly Sins. He isn’t, and he’s not. Thad comes from a spiteful family who never left much hope for love or support, and — to his great chagrin — he won’t grow up to be the hero of this story. It’s a bizarre sequence that plants a germ of raw hurt amidst a fertile topsoil of ridiculousness, and Sandberg is able to sustain that formula (in much funnier ways) when the action cuts to present-day Philadelphia, where a twerpy foster kid named Billy Batson (Asher Angel) is messing with some cops while searching for the birth mom who abandoned him at a Christmas fair a few years back. He’s the most powerless kind of person imaginable: Young, alone, and wracked by the vulnerability that comes from being painfully aware of those conditions. He might live in a world where the Justice League is on the front page of the newspapers every day, but not even Superman can save everyone from falling through the cracks. And then — just a few hours after being forcibly adopted into the most adorable foster family imaginable — young Billy is summoned by Shazam and endowed with his magic. For reasons that are never made as clear as they could be, this obnoxious tween nobody is the champion for whom the old wizard has been waiting. 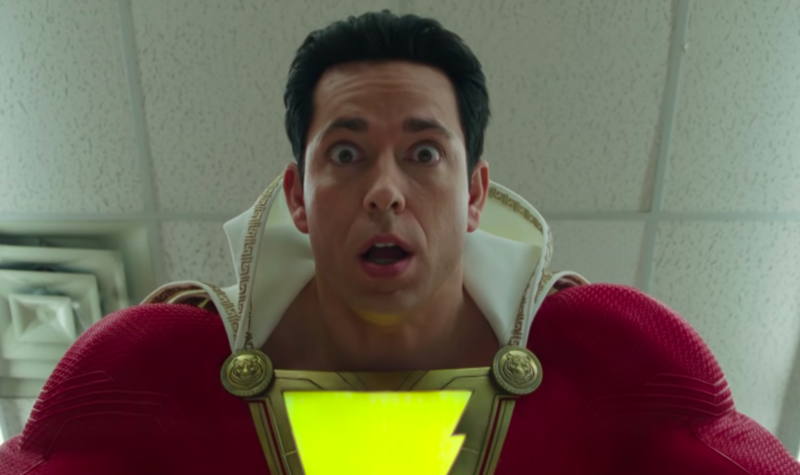 But the powers he inherits don’t come with instructions: All Billy knows is that when he says “Shazam!,” he turns into a swole adult man (Zachary Levi) who seems to be permanently sewn into a flashy red suit. Is there flesh under there, or is Shazam literally made out of spandex? Is he supposed to be an older version of Billy, or just the broad-shouldered husk of a generic hero? Such tantalizing questions will have to wait until the sequel. Whatever the case, this is still the fulfillment of a dream that’s shared by every kid in the DC Universe, and Billy is going to enjoy it; unlike the vast majority of movie crime-fighters, he actually wants to be a superhero, or at least to enjoy the perks of the job. Saving the world is kind of a slog, but it’s a small price to pay to feel good about yourself. To be needed. To fly. From that moment on, “Shazam!” is a blast, even if Billy is so caught up with his superhero wish-fulfillment that he doesn’t recognize how he’s on the cusp of realizing the only dream that’s ever kept him up at night: Having a family. And that family is the secret to this film’s success. From the moment Billy walks in the door of Victor and Rosa Vasquez’s (Cooper Andrews and Marta Milans) crowded foster house, you hope that it will become his forever home. There’s a palpable, Hollywood-calibrated warmth to that place, and everyone under its multicultural roof is essential to the mix. Faithe Herman is unspeakably cute as the pipsqueak Darla Dudley, Jovan Armand crushes it as the shy Pedro Peña, Ian Chen is a delight as the bookish Eugene Choi, and Grace Fulton is an understated force as the big sister who’s threatening to leave for college. But it’s Freddy Freeman (“It” star Jack Dylan Grazer, giving off major Fred Savage vibes while compensating for Angel’s comparatively flat performance) who really connects Billy to this motley crew of lost children. A sarcastic, disabled superhero fanatic who’s sadly in touch with his place in the world, Freddy would give anything to be Shazam, and Freeman marvelously conveys the bittersweet pleasures of second-hand excitement; Shazam is still the coolest thing that’s ever happened to him, even if it didn’t happen to him. Freddy has fantastic chemistry with Billy and his ultra-buff alter-ego alike, becoming a friend and a hilariously irresponsible mentor to them both as the film nails the anarchic excitement of two kids building a superhero from scratch. It’s unfortunate that Levi plays Shazam even younger than Angel plays Billy, and without even a sniff of empty stoicism — it often feels like Levi isn’t possessed by a teenager so much as he’s performing at a child’s birthday party — but overemphasizing the concept of their shared character has its perks. That feeling is especially pronounced when it comes to the villain, who could have been cast in the original “Ghostbusters.” Mark Strong brings his usual bad guy shtick to the power-mad Dr. Thaddeus Sivana, but the character — still bitter about his family, and searching for the power that eluded him as a kid — is touched by a darkness that runs much deeper than it usually does in movies like this. Thaddeus gets his power from the Seven Deadly Sins, computer-generated gargoyles who move with the herky-jerky horror of Gozer’s pet dogs. Sandberg’s coherent, tactile direction also harkens back to a time before every fantasy movie was pre-vizzed within an inch of its life. Sure, there’s plenty of digital effects work, and much of it shows the strain of the movie’s relatively meager $90 million budget, but even the biggest setpieces are layered, character-driven, and littered with solid grace notes. Case in point: Thaddeus runs over a Walking Piano during a second act fight scene in a Philly mall, a cute homage to “Big” that helps ground the conflict in a world of oversized children. Sandberg’s ability to keep things on a human level is crucial to a movie that feels unburdened by lore, wears its superhero trappings lightly, and saves the best gags and most satisfyingly emotional moments for its big finale — when the rest of its ilk tends to numb the audience with crashing spaceships, giant beams of light, and a numbing wallop of CG overload. Hell, even the mid-credits sequel tease finds a small way to hint at big things. But this heartfelt origin story is more than the sum of its immense charm and Spielbergian attention to detail. 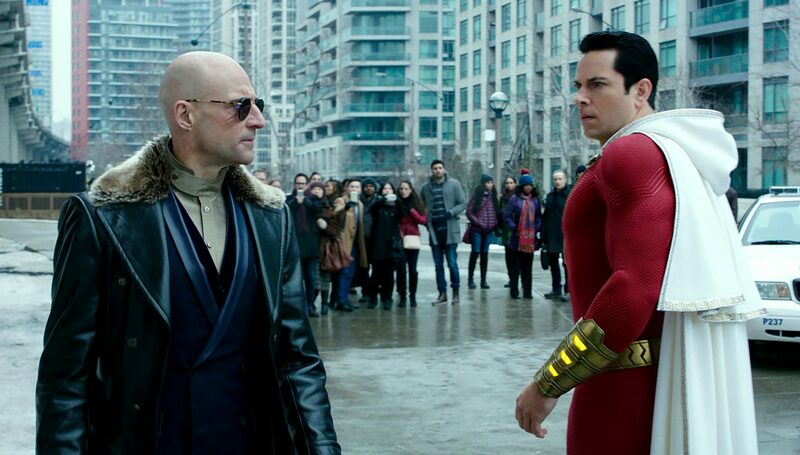 While either of those things would be enough to elevate “Shazam!” above most of its genre, the film’s power comes from its ability to ground them both in the emotional bedrock of the powerless. Yes, this is yet another effects-driven saga about an unsuspecting nobody who’s endowed with God-like strength, but it’s uniquely attuned to how the existence of superheroes would confront regular people with their own perceived weaknesses. Every part of this adventure is tethered to that idea, even as Henry Gayden’s clever script gradually turns it inside out; everyone feels taunted by their own potential, even as no one has the ability to fulfill it on their own. 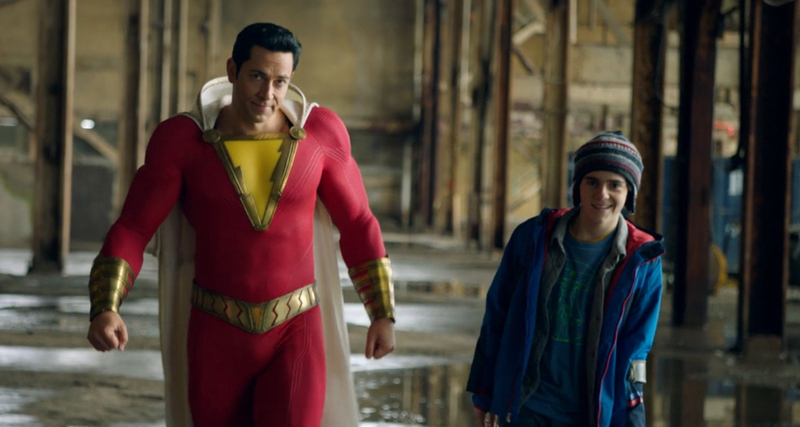 There are any number of movies about the magic of family — whether it’s the ones people are given, or the ones they find for ourselves — but each time Billy yells “Shazam!,” we’re reminded of something that Thaddeus hears on one of those godforsaken elevator TVs: “Family is more than just a word.” A lot more, it turns out. Warner Bros. will release “Shazam!” in theaters on April 5.